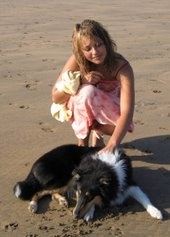 My sister Elena and Nemi at a beach in Cornwall, 2005. 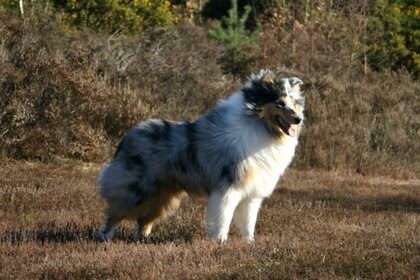 On this website, I would like to present my two lovely rough collies; Sonic (Wicani Dust be Diamonds) and Nemi (Ingledene Dancing Shadows). They are both such amazing personalities, and I feel very fortunate to have them in my life. Sonic is maturing very slowly, but he is becoming more handsome every day! 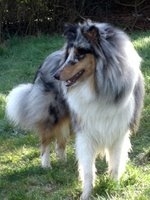 It is hard to believe that he is sixteen months now, as he is still such a puppy! He always has to be centre of attention, while Nemi is happier to take a back seat. Nemi is not too keen on the concept of dog shows, but Sonic will be campaigned increasingly as he keeps maturing and develops a nice adult coat.